In the last video update posted above the Elliott Wave analysis suggested two probabilities, both were pointing in the upward direction form a swing perspective for Gold (XAU/USD) however there was no clear entry signal. In the Hourly chart posted above there are some strong indications that this market will see a move to the upside. As such it looks like the Wave 2/b has completed as a complex w-x-y correction. The measure of Wave (w) projected from end of W.(x) is very near to the point where Wave (y) seems to have completed. 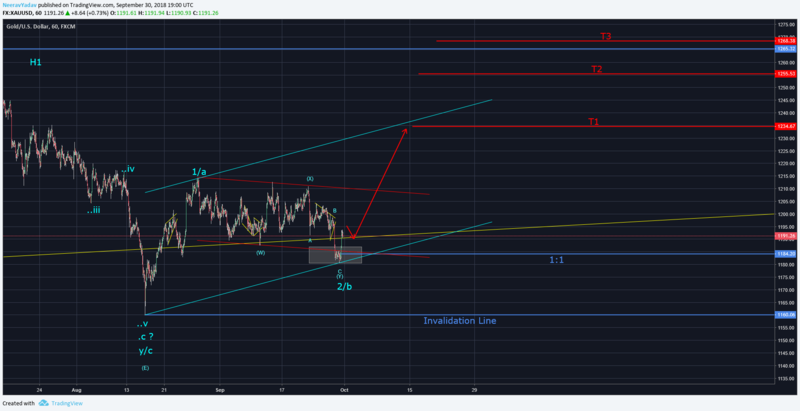 Also since the price move of Wave 2/b seems to have completed exactly in the most likely retracement zone (white support zone) this adds even more strength to the count. Since the structure will get Invalidated is see a move below 1160 hence the same should be treated as Stop loss level. This is all based on the Hourly chart, if this market follows the Wave counts suggested in the video linked above then we can see levels even higher then 1310.